Spore Explosion. If the spore carrier runt is within 20 feet of a hostile creature at the beginning of its turn, roll 1d6. On a 5 or 6, the spore carrier explodes. Each creature within 20 feet of the spore carrier runt must make a DC 10 Constitution saving throw, taking 17 (5d6) poison damage and contracting fungal spores on a failed save, or half as much in damage if successful. Bite. Melee weapon attack: +3 to hit, reach 5 ft., one target. Hit: 6 (2d4 + 1) piercing damage. Scratch. Melee weapon attack: +4 to hit, reach 5 ft., one target. Hit: 5 (1d6 + 2) slashing damage. Aggressive. 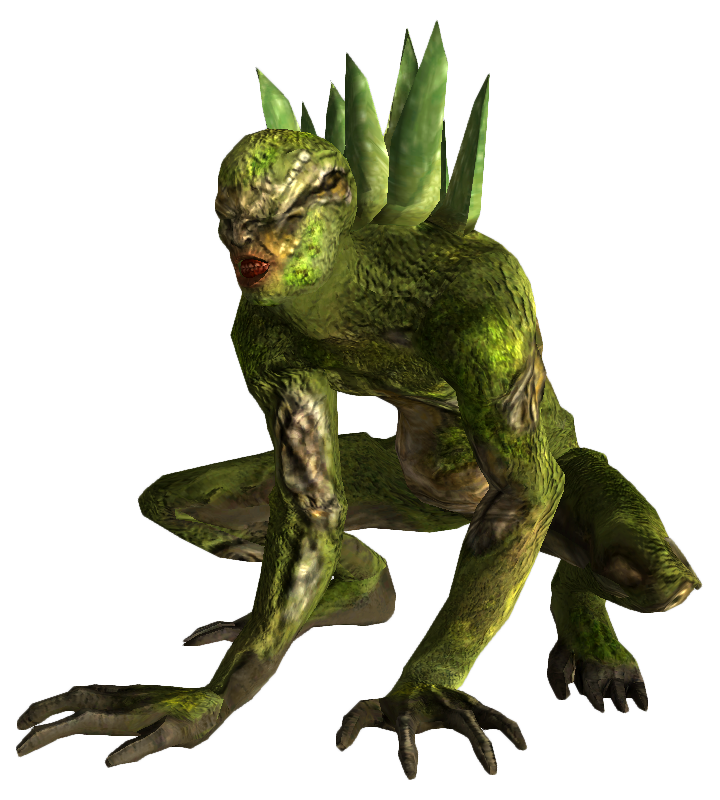 The spore carrier runt can move up to its speed toward a hostile creature that it can see. Spore Explosion. If the spore carrier is within 20 feet of a hostile creature at the beginning of its turn, roll 1d6. On a 5 or 6, the spore carrier explodes. Each creature within 20 feet of the spore carrier must make a DC 12 Constitution saving throw, taking 17 (5d6) poison damage and contracting fungal spores on a failed save, or half as much in damage if successful. Multiattack. The spore carrier makes one scratch attack and one bite attack. Bite. Melee weapon attack: +5 to hit, reach 5 ft., one target. Hit: 7 (2d4 + 2) piercing damage. Scratch. Melee weapon attack: +5 to hit, reach 5 ft., one target. Hit: 5 (1d6 + 2) slashing damage. Aggressive. The spore carrier can move up to its speed toward a hostile creature that it can see. Spore Explosion. If the spore carrier brute is within 20 feet of a hostile creature at the beginning of its turn, roll 1d6. On a 5 or 6, the spore carrier brute explodes. Each creature within 20 feet of the spore carrier brute must make a DC 13 Constitution saving throw, taking 17 (5d6) poison damage and contracting fungal spores on a failed save, or half as much in damage if successful. Multiattack. The spore carrier brute makes two scratch attacks and one bite attack. Bite. Melee weapon attack: +6 to hit, reach 5 ft., one target. Hit: 8 (2d4 + 3) piercing damage. Scratch. Melee weapon attack: +6 to hit, reach 5 ft., one target. Hit: 6 (1d6 + 3) slashing damage. Aggressive. The spore carrier brute can move up to its speed toward a hostile creature that it can see. Spore Explosion. If the spore carrier savage is within 20 feet of a hostile creature at the beginning of its turn, roll 1d6. On a 5 or 6, the spore carrier savage explodes. Each creature within 20 feet of the spore carrier savage must make a DC 13 Constitution saving throw, taking 17 (5d6) poison damage and contracting fungal spores on a failed save, or half as much in damage if successful. Multiattack. The spore carrier savage makes three scratch attacks and one bite attack. Aggressive. The spore carrier savage can move up to its speed toward a hostile creature that it can see. Spore Explosion. If the spore carrier scavenger is within 20 feet of a hostile creature at the beginning of its turn, roll 1d6. On a 5 or 6, the spore carrier scavenger explodes. Each creature within 20 feet of thespore carrier scavenger must make a DC 14 Constitution saving throw, taking 28 (8d6) poison damage and contracting fungal spores on a failed save, or half as much in damage if successful. Multiattack. The spore carrier scavenger makes four scratch attacks and one bite attack. Bite. Melee weapon attack: +8 to hit, reach 5 ft., one target. Hit: 9 (2d4 + 4) piercing damage. Scratch. Melee weapon attack: +8 to hit, reach 5 ft., one target. Hit: 7 (1d6 + 4) slashing damage. Aggressive. The spore carrier scavenger can move up to its speed toward a hostile creature that it can see. Spore Explosion. If the spore carrier beast is within 20 feet of a hostile creature at the beginning of its turn, roll 1d6. On a 5 or 6, the spore carrier beast explodes. Each creature within 20 feet of the spore carrier beast must make a DC 16 Constitution saving throw, taking 35 (10d6) poison damage and contracting fungal spores on a failed save, or half as much in damage if successful. Multiattack. The spore carrier beast makes five scratch attacks and one bite attack. Bite. Melee weapon attack: +10 to hit, reach 5 ft., one target. Hit: 9 (2d4 + 4) piercing damage. Scratch. Melee weapon attack: +10 to hit, reach 5 ft., one target. Hit: 7 (1d6 + 4) slashing damage. Aggressive. The spore carrier beast can move up to its speed toward a hostile creature that it can see.